Ecobank Group,the pan African bank has launched a ksh50million ($500000) Fintech Challenge for African startups and innovators. The pan African lender which recently went into a partnership with Microsoft to help move faster on their digital transformation strategy ,is willing to part away with ksh50000000 in a bid to tap into the talented fintech innovators services. This is one of the biggest support packages put together by any bank or investor to support Africa's technology startups.Fintech is the future of banking that's why we are opening our doors and vast market infrastructure to support Africa's brightest innovators, said Ecobank Group CEO,Ade Ayeyemi. Ecobank targets to support startups and innovators in the fintech,banking,programming and any related sector in technology.Participation is open to startups and innovators in all 54 African countries. Twenty (20) finalists will be invited to Lome in Togo at the Eco bank's Group Headquarters to an award ceremony and innovation fair. Service provider partnership deals for startups with strong capabilities to to become a pan-African service partner with Eco bank's country ecosystem. Mentoring and networking support where founders will be conferred as Ecobank Innovation Fellows for a period of one year,granting them access to networking and mentoring from Ecobank's vast global network of technology leaders ,fintech experts,innovators and management coaches. 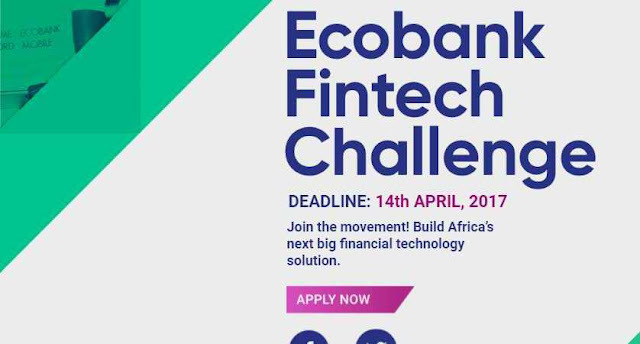 Startups and innovators interested in participating in the 2017 Ecobank Fintech Challenge should visit ecobankfintech.com and apply before the set deadline on 14th April,2017.Good luck!